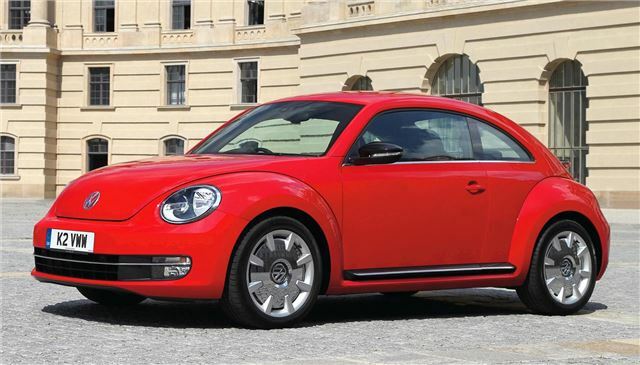 Volkswagen has opened the order books for the new Beetle, and prices start at £16,490 on the road. First deliveries start in Spring 2012. Two engines, a 1.2-litre 105PS TSI petrol and a 1.4-litre 160PS TSI petrol, are available at launch, and will be joined by a 1.6-litre 105PS BlueMotion diesel, a 140PS 2.0-litre diesel and a powerful 200PS 2.0-litre petrol later in 2012. Three trim levels are offered – Beetle, Design and Sport. Basic models come with a seven speed DSG gearbox as standard, as well as air-con, remote central locking, DAB radio and Isofix rear seat preparation. Mid spec Design models come with 17-inch alloy wheels, Bluetooth, iPod connectivity, front fog lights, alarm, multifunction steering wheel and body colour interior panels. Top spec models have large 18-inch wheels, tinted glass, cruise control, sports seats, parking sensors, gloss black door mirrors, dashboard and door panels, and 2Zone electric climate control. Optional extras include keyless access, sat nav, panoramic sunroof and bi-xenon headlights, as well as a powerful audio system developed with guitar maker Fender. Pricing and spec details are outlined below.